Alison Weir writes my absolutely favorite nonfiction. 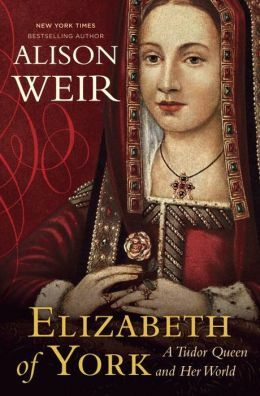 I couldn’t wait to get my hands on this timely biography of Elizabeth of York: daughter, sister, niece, wife, and mother to kings, and she perhaps should have been queen of England in her own right. THE COVERAGE: The book begins with a quick summary of the beginning of the Wars of the Roses. It’s not enough to give a lot of details or overwhelm the reader, but glances over Henry VI, the Kingmaker Warwick, and how Edward IV got to the throne. Elizabeth’s story then begins with birth of Edward’s first child, a princess. It continues through her trips into Sanctuary, engagement to the French dauphin, possible romance with Uncle Richard III, marriage to Henry VII, riding out various pretenders who claim to be one of her lost brothers (the “princes in the tower”), birth of royal children (including Arthur, first husband to Catherine of Aragon; Margaret, queen of Scotland; Henry VIII; and Mary, queen of France), and eventual death and burial. TEACUP RATING: I give this five teacups, but remember, I generally love Alison Weir’s nonfiction. (Her fiction can be hit-or-miss for me, although I found the last one, A Dangerous Inheritance, very good.) Some readers may be tempted to skip over lists of Elizabeth’s accounts…I personally find that primary source fascinating. ON SALE DATE: Elizabeth of York: A Tudor Queen and Her World will be on sale in the USA on December 3rd.